It’s becoming a regular event in the stock market. A stock plummets on concerns that Amazon is going to hurt its business. Often, the fears come before Amazon even announces a business strategy to take on the company that suffers. On Friday, Costco Wholesale Corporation (Nasdaq: COST) fell victim to Amazon fears. Shares of the company sold off despite an earnings report that beat expectations. Costco reported results for the fourth quarter of its fiscal year. Full year results for both revenue and earnings exceeded analysts’ estimates. For the year ending September 3, Costco earned $5.89 per share, ahead of analysts’ expected $5.77 per share. Sales of $129 billion, up almost 9% year over year, were also ahead of the consensus estimates of $128.5 billion. Other closely watched metrics were equally strong. Same-store sales rose 3.8% in fiscal year 2017. E-commerce sales, a closely watched variable after Amazon.com Inc.’s acquisition of Whole Foods and Walmart Stores Inc.’s greater push into online retail, were up 13%. Chief Financial Officer Richard Galanti said in the company’s post-results call that the retailer had started offering two-day delivery of dry groceries as well as a same-day delivery service for groceries including fresh foods. The two-day delivery would be free for online orders over $75 across the United States, while the same-day service – offered through its partner Instacart – is available at 376 U.S. stores. BMO Capital Markets analyst Kelly Bania said the new offerings were a huge positive for Costco given the perception that it has been slow with its pace of digital transformation. “(But) we also see risk these initiatives will weigh on margins over time and may be viewed as defensive,” she said. Costco CFO Galanti also noted that Whole Foods’ price cuts had not impacted Costco and that it had not reduced its in-store prices in response to the deal. But, the retailer will be battling Amazon online. The company said it will be lowering online prices and adding more high-end and well-known brands such as GE appliances and Spyder skiing apparel to its ecommerce site. And, in summary, “It’s not a comedy, it’s a tragedy,” Cramer said. For the most part, COST has been in an up trend since 2014. There were signs that the trend was weakening last summer when prices briefly cut below the long term trend line. The subsequent recovery on high volatility left a large top pattern on the chart. The stock has now been below the trend line for several months. Technical analysts generally expect a trend line to support the upward progress of the stock. Once broken, analysts expect support to become resistance. That can be seen on the chart above. COST is now facing resistance on a technical basis and the stock may struggle for some time. The stock is also facing resistance from a fundamental perspective. This is shown in the next chart which is a long term view of the company’s net income margin. Net income margin is the percentage of revenue remaining after all operating expenses, interest, taxes and some other accounting charges are deducted from a company’s total revenue. The problem for Costco is that it is in a low margin business. With margins near 2% and holding steady, growth in earnings will be driven by growth in revenue. If the company faces pressure from Amazon, there is a concern the already low margins could suffer and growth in revenue is likely to be slow. These are bearish factors for the stock. This all seems to confirm that sellers were right for the past few months and COST is unlikely to rebound for some time. In all likelihood, the stock will remain under pressure from sellers. 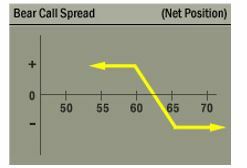 To trade a potential decline in the stock, a trader could buy a put. For COST, it’s not surprising that put options are relatively expensive. The stock is in a downtrend and its recent selloff led to increased volatility which raised options premiums. This is normal when a steep selloff occurs. The high price of the put option suggests an alternative strategy. The option premium is high because the expected volatility of the stock is high. Options that are based on selling an option can benefit from high volatility. In this case, with a bearish outlook, a call option should be sold. For COST, we could sell an October 20 $160 call for about $1.30 and buy an October 20 $162.50 call for about $0.70. This trade generates a credit of $60, which is the difference in the amount of premium for the call that is sold and the call that is bought multiplied by 100 since each contract covers 100 shares. That is the maximum potential profit on the trade. The maximum risk on the trade is $180. The risk is found by subtracting the difference in the strike prices ($250 or $2.50 time 100 since each contract covers 100 shares) and then subtracting the premium received ($70). This trade offers a return of about 39% for a holding period that is about two weeks. This is a significant return on the amount of money at risk. This trade delivers the maximum gain if COST is below $160 when the options expire, a likely event given the stock’s trend. Call spreads can be used to generate high returns on small amounts of capital several times a year, offering larger percentage gains for small investors willing to accept the risks of this strategy. Those risks, in dollar terms, are relatively small, about $160 for this trade in COST.